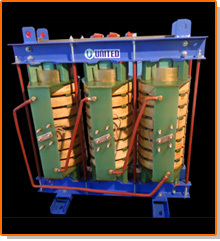 United Insulation Industries has developed Ventilated Dry Type transformers in India with both type (i.e. Cast Resin or Resin Impregnated and also United Sub Station). Our transformers are manufactured with UL® Certified Insulation Materials and Systems, by a network of ISO 9001 Certified Manufacturers and meeting the highest of International Standards for Quality, Design, Construction and Performance. 3 No pollution from leaks solution. 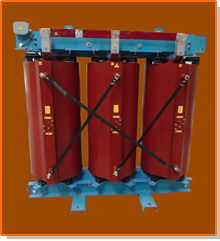 12 See this Cast Resin Dry Type transformer is high effieciency considering lower losses as per client requirement. 9 Partial Discharge Free of Partial Discharge Partial Discharge is possible due to high probability of bubbles formation during casting. United Insulation Industries manufactures Ventilated Dry Type transformer ranging from 25 KVA to 5000 KVA with voltage class of 33 KV. These transformers are fitted in Enclosure confirming to IP 21 to IP 33 for Indoor location and IP 45 for outdoor location. 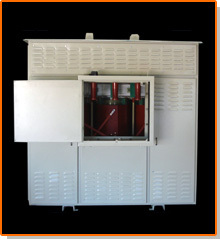 United Insulation Industries are manufacture Ventilated Dry Type Transformer are totally maintenance free and safe from fire as material used are metals, ceramics, fiberglass and resin. It is environment friendly as there is no oil, hence handling becomes easier and there are no chances of spillages and leakages and there is minimal non toxic smoke in case of fire. United Insulation Industries are offers Ventilated Dry Type Transformers with Class H / C insulation which can bear heat up to 180 / 220 Deg C and can be used in humid and chemically polluted atmosphere. United Insulation Industries can supply Indoor/Outdoor, 3 phase, 50/60 Hz, Resin Impregnated, AN (Air Natural) /AF (Air Forced) cooled, step up/step down, double wound with Cu conductor transformer from 25 KVA to 5000 KVA up to 33 KV Class with H / C Class Insulation and designed to withstand Short Circuit, & Impulse Test in accordance to IEC / IS. Core structure is of non aging, Cold Rolled Grain Oriented, high permeability silicon steel. All core laminations are free of burr and staked without gaps The core assembly is painted with a protective paint to protect against corrosion. LV & HV Windings are done in dust free air conditioned winding shops. Rectangular copper strips are used for LV winding insulated with Nomex® while HV winding are of copper wire insulated with Nomex® or suitable material for temperature rise if wrapping is not possible due to small diameter. 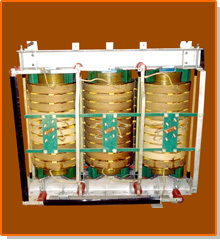 The Transformer coils are thoroughly dried in an oven and the coils are then completely sealed with an insulating Varnish / Resin (Class H / C) through an vacuum pressure impregnation process. The VPI process fully penetrates and seals the coils into a high strength composite unit for complete environment protection, hence can be used in humid and chemically polluted atmosphere. Coils are then cured to develop bonding. After the Core- Coil assembly. All transformers are tested for routine test. United Insulation Industries has in house facilities for conducting all routine tests as per IEC & IS. Our VDT Transformer are guaranteed for satisfactorily performance for a period of 5 years* from the date of dispatch. Any part found defective during this period, as a consequence of bad design, manufacturing or workmanship should be repaired, free of cost, by us within mutually agreed schedule. * Warrantee for 5 Years on active part only. 1 Transformers insulated with NOMEX® brand materials are extremely safe, even when exposed to fire. 2 High flame resistance, and low smoke and no toxic off-gasses. 3 Class H & C ventilated dry type transformers can be built smaller, reducing the footprint to the environment, conserving space. 4 Insulation is friendly to use during manufacturing - no skin irritants or surface chemicals. 1 NOMEX® insulation can be easily disposed of by incineration or burial, since it is inert to the environment. 2 NOMEX® insulated VDT transformers have low volumes of insulation, eliminating the burden of disposal of large amounts of resin. UNITED INSULATION INDUSTRY is certified for ISO 9001:2008. United Insulation Industries makes Indoor/Outdoor, 3 phase, 50/60 Hz, Resin Impregnated, AN/AF cooled, step up/step down, double wound with Cu conductor transformer from 40 KVA to 5000 KVA up to 33 KV Class with H / C Class Insulation and designed to withstand Short Circuit, & Impulse Test in to IEC / IS. 1 The dimensions and weights shown above apply to a typical range of UII (UII standard transformers) design to the specification IS : 2026. As all transformers are usually design and built to customers specification their exact dimensions and weights can vary. 2 Due to improvements continuously taking place in design, the details given here may vary marginally irrespective of Length, Width, Height and Total Weight. However the variations will be within permissible tolerance limits as per IS 2026 latest. OPTIONAL FEATURES ARE AVAILABLE ON BUYER'S REQUEST SAME SHALL BE PROVIDED AT AN EXTRA COST ONLY.